Braccae is the Latin term for "trousers", and in this context is today used to refer to a style of trousers made from wool. According to the Romans, this style of clothing originated from the Gauls. Braccae were typically made with a drawstring, and tended to reach from just above the knee at the shortest, to the ankles at the longest, with length generally increasing in tribes living further north. 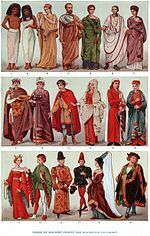 When the Romans first encountered braccae, they thought them to be effeminate (Roman men typically wore tunics, which were one-piece outfits terminating at or above the knee). The word originates from the Gaulish bhrāg-ikā, after going through a process of syncopation it gave rise to braca 'trouser, pants'. Chained Germanic, 2nd century A.D. Bronze. The prisoner wears braccae that were typical for Germanics. His hair is tied in a suebian knot. The word is cognate with the English breeches. It appears to derive from the Indo-European root *bhrg- 'break', here apparently used in the sense 'divide', 'separate', as in Scottish Gaelic briogais or in Breton bragoù and brycan/brogau in Welsh. The Celtic form may have first passed to the Etruscan language, which did not distinguish between the [k] and [g] sounds. Transition through Etruscan accounts for the Greek amorge being rendered as Latin amurca, Greek κυβερνἂν (kubernân) as Latin gubernare. ^ Delamarre, Xavier (2008). Dictionnaire de la langue gauloise: Une approche linguistique du vieux-celtique continental (in French). Errance. ISBN 9782877723695.